Yates Center, the county seat of Woodson County, is a small farming community in the southeastern part of the state with a population of 1,417. It is known as the “Hay Capital of the World”. At Yates Center High School, home to the Class 2A Wildcats in the Three Rivers League, there is a young man making a name for himself across the state of Kansas and that is junior distance runner Hadley Splechter. Splechter, a 5-foot-10, 145-pounder, is one of the states top runners, regardless of classification. He put himself on the map last year as a sophomore as he captured three 2A state titles at the 2017 KSHSAA State Track and Field Meet in Wichita last May. Splechter won the 1600, 3200 and was a part of the 4x800 relay to take home three golds. Not only did he pick up two individual titles as a sophomore, he set the all-time 2A state record in the 1600 at the state meet with a time of 4:21.70. Meaning he is the fastest 2A 1600-meter runner of all-time in the long-storied history of Kansas High School Track and Field since 1911. He would also win the 3200 in a time of 9:46.82. 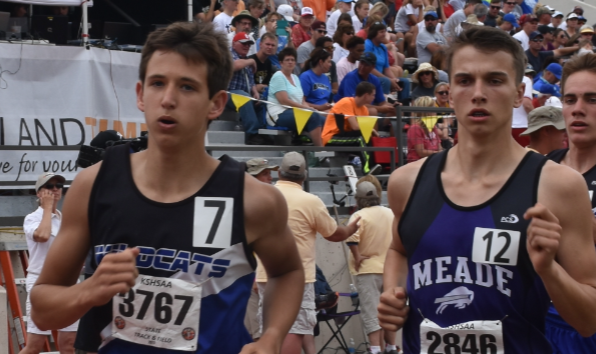 His 4x800 squad of (Smith, Bedell, Forsyth) would also win the 2A Boys 4x800 run with a time of 8:19.61. Splechter has shown that it doesn’t matter where you’re from to be one of the best, if not the best distance runner in the state of Kansas. But he’s not the first either over the years and you would know that by going to the state outdoor each and every year. Stop watches and tape measures don’t lie, no matter if you’re from a 6A town of 100,000+ or a 1A town of 300. The best distance runner in all classifications of Kansas last season was Kyler True of 1A Olpe, who didn’t even have a track at his high school. Just over 10 years ago we saw Lane Boyer of Fredonia in 3A be the best runner in the state. Girard’s Cailie Logue will go down as one of the best, if not the best, girls distance runner in Kansas history for cross country and track. It’s not uncommon for the best of the best to come out of small town America and this year the best in Kansas could be out of Yates Center. Splechter is primed for a huge junior season not only as an individual but for also his team. His cross-country team won the 2A state team title this fall and he was the individual state champion in 2A with a time of 16:05.1 in the 5K race at Wamego Country Club. He beat all competitors by at least 13 seconds. Teammates Colin Bedell and Jordan Smith took sixth and seventh respectively. All four of the 4x800 guys mentioned above are back for this year’s team and are looking to repeat in that event. Yates Center is also looking to double up with a cross country and track & field team title this year. But for now Splechter and the Wildcats are looking to improve over the next month and a half as the 2018 campaign has already kicked off with one meet under their belt. We caught up with the rising junior star in the latest Q&A edition of Faces in Kansas below. This feature is presented by Yates Center Branch Bank in Yates Center, Kansas. Proud to support the Yates Center Wildcats. Equal Housing Lender, Member FDIC. Click on our ad to the top right to visit our website. My older brother, friends, and I were always playing sports against each other when we were young. Just playing around in the yard with them made me excited for organized sports in school when I got older. For the whole team I’d like to see a top three finish at state. For me as an individual I want to win all four events I’m planning on doing at state. What is it like to run at your school? It’s a lot of fun since we’re a small school, you are usually pretty good friends with your teammates. That makes it more fun to practice and compete. How awesome was it to capture multiple titles at Cessna? Not much compares to that feeling. The atmosphere there is incredible, and it’s such an amazing adrenaline rush when you get to run and do well in front of that many people. I think my main strength is my mental strength. I never lose sight on the long term goal, and never get discouraged if something doesn’t go my way. My main weakness is my sprint speed, I need to get faster when it comes to the final part of a race. Right after state track I’ll take about three weeks off where I don’t run at all. During the summer I go on mostly long distance runs to get ready for cross country. During the winter I am usually occupied with basketball practice, but on the weekends I go on distance runs to keep my stamina up. Then it’s track season and I focus on getting ready for state track. I’m planning on going to run in college, preferable division 1. I have had some contact with coaches from a few schools, but I haven’t made any serious decisions on where I want to go. Other key athletes on your team this year? Obviously all of our distance runners are going to be key to getting points at state. I’m excited to see how one of our new sprinters John Righini does this year at the bigger meets we go to. Best runner you’ve ever faced and who are some key ones this year? Easily Kyler True. I’m looking forward to running against my friend from Meade, Ethan Thompson. We will race at state, and he’s a talented athlete, so it will be a lot of fun. I enjoy it because it’s small. Everyone knows each other, and knows what’s going on in the community. I think it brings everyone closer when you live in a smaller town instead of a city. I like math because it’s usually applied to the real world. As long as everything goes as planned, I’d like to be living on my own, have a steady job that has to do with my major in college, and hopefully still running for fun. I’d like to have a dog at this point too, and maybe a girlfriend. I really like mexican food, and there is a pretty good mexican food restaurant in Iola, which is about twenty minutes away from Yates Center. It’s worth the drive.